Checking out Amazon today, I saw this interesting pedal for a crazy cheap price. The pedal is the Behringer VB1 Vintage Dual Dynamic Filter. According to Behringer’s site the VB1 simulates vocal sounds with a sweeping filter. 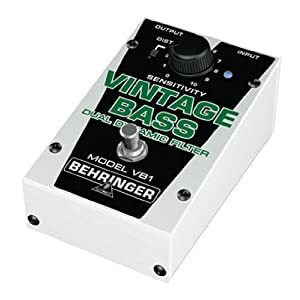 This pedal normally lists for $60, but is on sale for only $17.25 (yeah.. that’s correct) at Amazon and is eligible for FREE super saver shipping. Limited supply. I was unable to find a video with this, but I’m able to bring in some sound clips from Behringer’s site. Mine went up to $17.54 but still a great deal nonetheless! And if it doesn’t work out, I can always bend it! Great catch!! !